Venture into the southern Adriatic region of Apulia on the heel of Italy and you will be well rewarded in terms of the natural beauty of the landscapes and the richness of the heritage of a varied history. This holiday includes visits to no less than five UNESCO World Heritage sites, all very different in character – the conical ‘trulli’ homes of Alberobello, the ancient stone ‘sassi’ houses of the Matera ravines, the Swabian castle of Castel del Monte, Santa Sofia in Benevento, and the Royal Palace at Caserta. As well as staying in Caserta itself you also spend time in Bisceglie on the coast in Apulia. Travelling between the two gives you the opportunity to see the Roman town of Benevento and to enjoy the countryside of the southern Apennines. Day One: Flight to Naples. On arrival, transfer to your hotel in Caserta (30 minutes approx) for one night’s half board accommodation. Day Two: Depart for Barletta. Crossing the Apennines, your main stop today is in the pleasant town of Benevento. It has a compact centre and enjoyed prominence during three main periods, each of which left its mark on the town. The Romans left Trajan’s Arch, and Caracalla’s theatre; after the Romans, the Longobards left the cloistered church of Santa Sofia. Benevento then became part of the Papal States and this period leaves us two fine basilicas, Madonna delle Grazie and Saint Bartholomew. In the afternoon, you continue into Apulia along the motorway, stretches of which are very scenic as it wends its way through the southern Italian hills as far as the Adriatic. 135 miles today. Four nights are spent in Barletta on a half board basis. Days Three to Five: In Barletta with two included excursions. 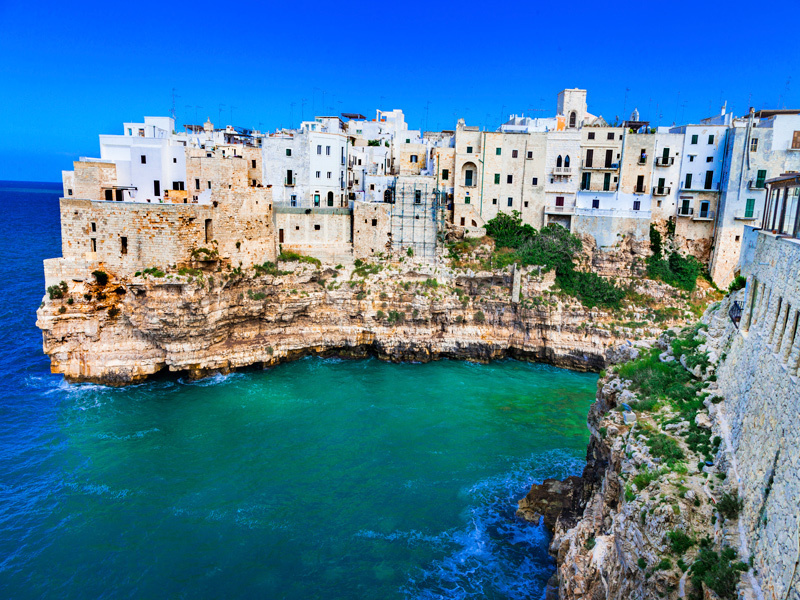 A full day excursion includes visits to Apulia’s capital city, Bari, with its 12th century cathedral of St Nicholas, a major destination for both Orthodox and Roman Catholic pilgrimages. Nicholas’ relics were moved here from Turkey in the 11th century. Also called Nicholas the Wonderworker, he was known for his generous giving and lends his name to the Santa Claus tradition. You continue to Alberobello, into one of the most unusual landscapes you will ever see, that of the trulli. These circular white houses have conical slate roofs and are built without mortar – some say this was done so they could be easily demolished and rebuilt if the tax collector was coming! In any event, the thick walls help keep them cool in summer, warm in winter; they are often decorated with planetary symbols. 146 miles today. There is also a shorter but equally fascinating included tour to Trani and Frederick II’s Castel del Monte. Trani is a particularly pleasant maritime town with a fine cathedral and old quarter right on the azure sea. This was a crusaders’ port and the Knights Templar built a church here. The geometry at Castel del Monte is perfect : it consists of eight octagonal towers around two rectangles which form another octagon – the ‘golden ratio’ is ever- present as are the magic numbers of Fibonacci – the Pisa mathematician who visited Frederick’s court. If these ring ‘da Vinci Code’ bells, then why not add that Frederick (excommunicated twice and a Crusader) and his castle have also been linked with the Arthurian legend and the Holy Grail! 50 miles today. Day Six: Today you begin to head back towards Naples taking a different road through Apulia. You go first to Matera, just outside Apulia in neighbouring Basilicata. In the ravines which cut starkly through the town are the primitive ‘sassi’ (stone) houses in which half the town’s populace lived until the 1950’s, when they were forcibly moved to more modern housing. The suffering of the malaria-ridden, starving people of the ‘sassi’ was immortalised in Carlo Levi’s ‘Christ stopped at Eboli’. From there you head back to Caserta, passing by Potenza and Salerno, for two nights on a half board basis. 233 miles today. Day Seven: Included Caserta walking tour with entrance to the Royal Palace and its lovely gardens. Known as the Italian Versailles, the palace has 1,200 rooms and is probably the largest royal palace in the world. It has been used as a set for several movies, including two of the Star Wars films. Outside, you can explore the park and formal English garden, with several impressive water features. Day Eight: Free time till your transfer to the airport for your flight home. Please note: Sunday departures spend the first two nights, and the last night, in Caserta. The order of the programme is adjusted accordingly so e.g. the activities of Day Seven will take place on Day Two: but the content of the holiday is the same. The hotel is centrally situated close to the pedestrian shopping area and just 200m from the Royal Palace. The hotel has a small lounge bar, breakfast room and fitness room. Bedrooms are air conditioned and have shower, minibar and tv. Dinner is taken in a nearby restaurant. The hotel is a 2-minute walk to the beach, 5 minutes from the Norman castle and gardens and a 15-minute walk to Barletta’s famous Colossus – a 13ft bronze statue in the old town. Bedrooms have air conditioning, hairdryer, tv, bath or shower, and minibar. The hotel has a lift, restaurant and outdoor pool (seasonal) and lobby bar. Wifi is free throughout the hotel. Superior rooms are available at a supplement.